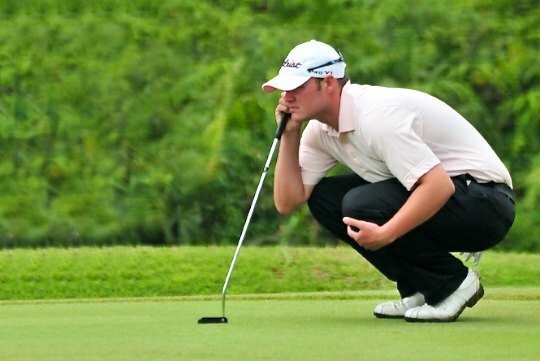 Young Victorian professional Tom Dreher has had a tough start to his professional career but is confident good golf lies ahead. The 25-year-old has played two events on the China PGA Champions Tour in Shenzhen and Zhengzhou for two missed cuts since gaining his half card in March. While completing his traineeship, Dreher didn’t compete professionally in 2010. “From being out of competitive golf for the last 12 months, you hit a couple of loose shots just from the added pressure of playing tournament golf,” he said. Dreher has worked hard on his fitness in Melbourne between events and also his game with coach Matt Cleverdon at Kingston Heath. Dreher, who completed his entire traineeship at the Royal Melbourne Golf Club, says the conditions in China have taken some adjusting to. “It’s completely different. We’ve got 10 degrees (in Victoria) and it’s high 30s so it’s hot and humid,” he said. Dreher said he’s already learning how to survive better on tour. “It’s a really good tour to get experience and you get used to dealing with all the pressures and the things that go wrong when you’re out on tour,” he said. Dreher said the tournament’s he’s played so far are not as well-organised as he’d hoped. Dreher said the venue of his second start on the tour was not confirmed until two weeks before the event. “That’s the hardest part when you’re trying to book flights and organise yourself to be right for the week. You know when it is but you don’t know what it’s going to be so you can’t try and practice for the conditions that it’s going to be,” he said. Although his half card only granted him four starts, Dreher said he may see far more action on the fairways in Asia. “The last event didn’t have a full field so it looks like I’ll get a start in every event and will probably get OneAsia events as well,” he said. Dreher’s main goal for this year is to maintain his card but he has a definite plan thereafter.